The golden age of guitar pedals has brought great success to dozens of small boutique pedal builders. While many of these builders have found fame with an original design or two, catapulting a handful of builders to even greater heights, there always comes a point when markets reach over-saturation. And sometimes the risk-taking ethos that once drove creativity diminishes, leaving a trail of “me, too” offerings that exist merely to fill out companies’ product lineups. It isn’t always clear when this is happening, and while I’d like to think that most of the time pedal builders mean well, sometimes less inspired pedals do make their way to market. It’s easy to get swayed by trendy pedal builders and/or those with an interesting style or visual appeal. This article (and this site for that matter) is for guitarists who never sacrifice due diligence for familiarity or the assumed infallibility of any particular builder’s reputation. The whole idea behind using guitar pedals is the freedom to mix-and-match different pedals to create a palette of tones and effects that suits your music and guitar playing style. While it’s natural to lean towards a particular pedal builder that resonates with you, keeping an open mind to new ideas (and new effects) can open up unexpected pathways on your journey of musical evolution. Innovative effects pedals can come from anywhere, and sometimes builders fall in and out of favor or lose their way. Yes, many modern pedal builders are filling out their line-ups to stay competitive as we near the summit of guitar pedal mania. If one of your favorite builders is doing this, chances are that many of their latest pedals are still pretty solid even if another builder makes a similar pedal that is arguably “better” by various measures of qualified criticism. We’re going to continue to steer clear of many of these less-than-stellar pedals in an attempt to keep the focus on the very best guitar pedals available today and those appearing on the horizon. While the statements below don’t constitute a final review verdict for the pedals listed, there are some nuggets of commentary, praise, and criticism that you may find useful. As always use your best judgement when making buying decisions and don’t let your G.A.S. be fueled by the hype machine. If you’ve seen our top pedal lists for Winter NAMM 2015, Summer NAMM 2015, & Winter NAMM 2016, you already know what to expect. The pedals aren’t in strict “best to worst” order, but the most exciting all-new pedals are generally listed towards the top in accordance with the level of excitement generated. 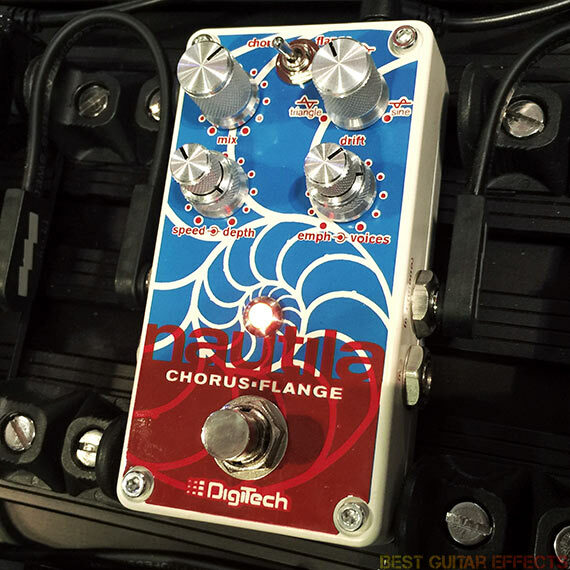 Now here are the Top 16 Best Guitar Effects Pedals of Summer NAMM 2016. Sometimes you hear something one way, but it was actually intended to be heard differently. Like lyrics in a song. Surely you remember singing along to some song thinking you knew the words only to find out later that the singer was singing something entirely different. That is the essence of the Mondegreen delay pedal. The Mondegreen has 3 modes: Stutter, Whirl, & Sheer. It doesn’t do the pedal justice to simply state that these modes add tremolo, chorus, & octave up pitch-shifting to the delay repeats. There’s a certain “life” to the sounds produced that make this pedal one of the more unique experimental delay/modulation pedals I’ve ever heard, recalling a uniqueness found in such quirky gems as the Red Panda Particle, Boss PS-3, & EarthQuaker Devices Rainbow Machine. This pedal also has a configurable exp pedal input. I was getting some truly mind-bending sounds at SNAMM with an exp pedal and the Sheer mode’s spiraling octave up madness. On a side note, I’m still awaiting confirmation if the exp jack is definitely CV (control voltage) compatible. Will keep you posted when I’m 100% sure. Crossing my fingers that it is so the Mondegreen can be used with modular synth modules and pedals like the amazing WMD Protostar and Dwarfcraft’s Twin Stags. OBNE’s other pedals (minus the OBNE Haunt fuzz) are also getting exp pedal inputs as well. Yes, even the epic Dark Star reverb, a great pedal that I was somewhat less excited about due to the absence of exp pedal control. If they’re also CV compatible this will be beyond amazing. The Old Blood Noise gang have also added soft-touch switching to their non-Haunt pedals, including the Mondegreen. The relays on the pedals at SNAMM didn’t remember if the pedals were on or off when last powered. Really hoping this is addressed before the pedals ship as “smart” relay bypass switching that defaults to the last powered state would make the pedals more friendly for use with effects switchers. My heart was broken when EQD went the route of lazy relay bypass on all their new pedals for 2016, and I’m really hoping OBNE doesn’t crush my soul a second time. Lazy relay switching wasn’t an issue in the pre-effects switcher days, but having to re-activate all the lazy relay pedals at gigs is becoming more of an annoyance when a little extra programming can eliminate this minor usability problem. 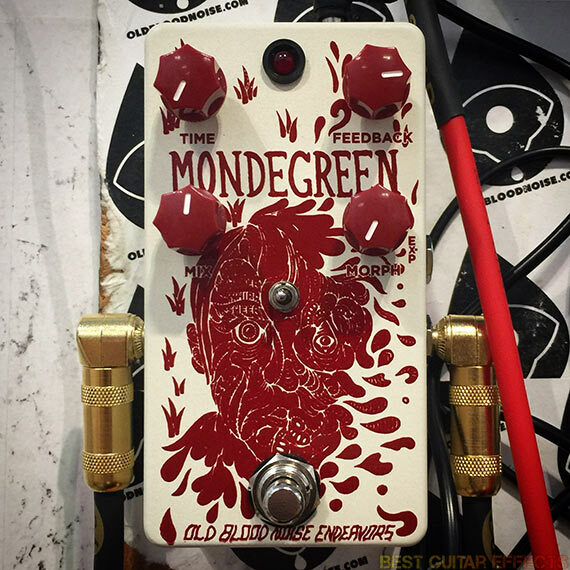 Aside from my two initial critiques (which are non-issues for guitarists who don’t use effects switchers and don’t care about CV), the Mondegreen is the pedal with the sounds I found most mesmerizing at Summer NAMM 2016. Big props to Brady, Seth, & the rest of the OBNE crew for the great strides they’ve made over the past couple years to become one of the most exciting boutique pedal builders to watch in 2016. One last thing: the word at the show was that the Mondegreen’s algorithms were programmed in-house, not outsourced as with OBNE’s previous digital effects. I consider this a bold testament to their dedication towards realizing the sonic visions they’d like to share with the world. Dwarfcraft has been killing it lately. The Silver Rose V2 is a monster, the Necromancer fuzz rocks, and their Twin Stags tremolo is an inspiring crossover into modular effects territory thanks to its extensive CV (control voltage) compatibility. Dwarfcraft’s Happiness reaches farther into the realm tread by their Twin Stags by offering synth style filtering and CV control possibilities in a similarly Twin Stags sized enclosure with plenty of available parameter control. You get the expected high pass, low pass, and band pass filtering modes from the State switch. A Scramble switch activates a “slightly smoothed” sample and hold function. You can use CV to modulate the Filter and Scramble function. You can also send the LFO out to modulate another effect pedal or synth module. And there are expression pedal inputs for the Filter and LFO. Tons of fun and happiness awaits your exploration. 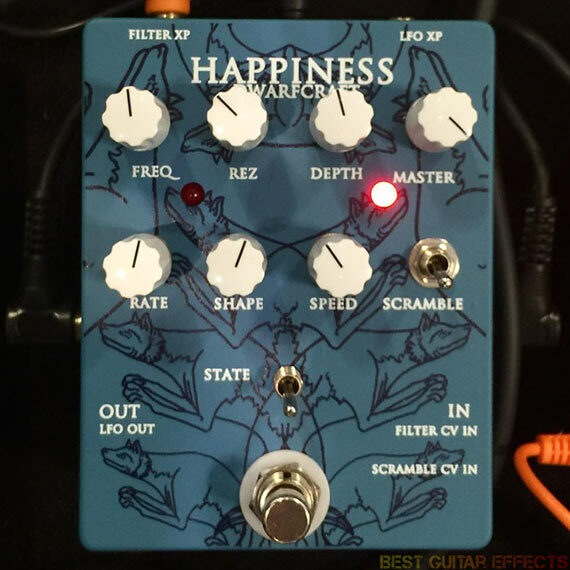 Dwarfcraft is steadfastly carving out a nice little happy place for effects loving guitarists and modular synth junkies thanks to their Twin Stags & Happiness, and I do hope they continue down this path and release more guitar pedals in this vein. Fox Pedals had several interesting pedals to show off at SNAMM. Their soon-to-be-renamed delay pedal (looks like it’ll be called the “Novaplex”) is derived from the analog voiced digital delay of their “The Wave” pedal but with a new modulation section (including a chorus mode), tap tempo, and subdivisions. The biggest surprise is that the delay pedal has a side port for connecting to Fox Pedals’ upcoming Storehouse preset controller. 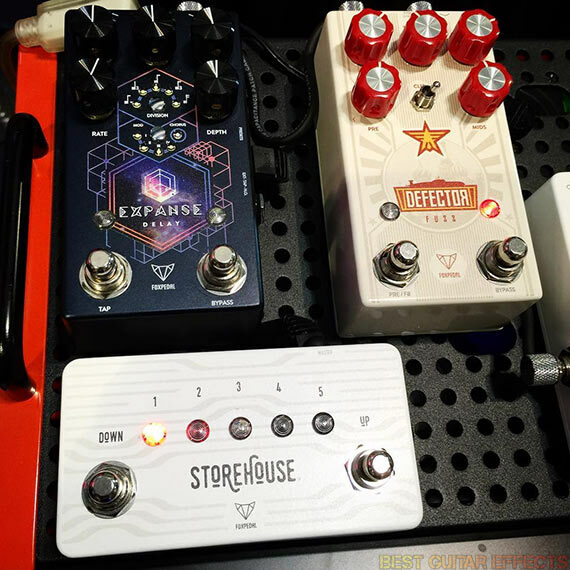 While Fox Pedals is still working out how the controller will function in use, the Storehouse prototype shown at SNAMM had 4 ports for connecting to up to 4 compatible pedals for preset selection. Lots of exciting possibilities here, so expect Fox Pedals to make more upcoming pedals Storehouse compatible. It’s also worth giving a shout-out to their mutant-muff Defector Fuzz, which takes the Russian flavored muff into interesting new territory thanks to a bit-crushing feedback mode. I definitely want to hear how this one comes along. The Keeley Electronics Monterey Fuzz was an instant hit, taking their Workstation series of pedals into modern Jimi-fied territory. The Dark Side is an obvious nod to Pink Floyd’s classic Dark Side of the Moon LP, with the sounds within evoking a modern interpretation of various David Gilmour influenced effects. The fuzz side trades the classic “Fuzz Face” inspired flavor for a suped-up Big Muff on steroids. Think along the lines of Keeley’s Psi Fuzz but with more tonal variation thanks to a 3-way flip-switch with Flat, Full, & Scoop options. 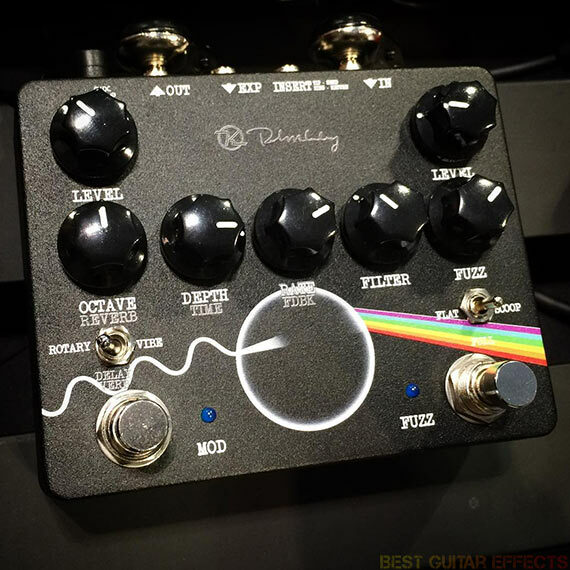 The version of The Dark Side at SNAMM had a mod section with Rotary, Vibe, & Delay/Verb modes, but the final version could be expanded with 3 foot-switches that allow fuzz, mod, & delay/verb to be used together. Keep your fingers crossed. As is, I was still blown away by the pedal and to my surprise enjoyed it even more than the Monterey. Keeley no doubt will have another hit on their hands when The Dark Side drops. I think I can go ahead as say that the Greer Amps Super Hornet was my favorite fuzz pedal shown at Summer NAMM 2016. 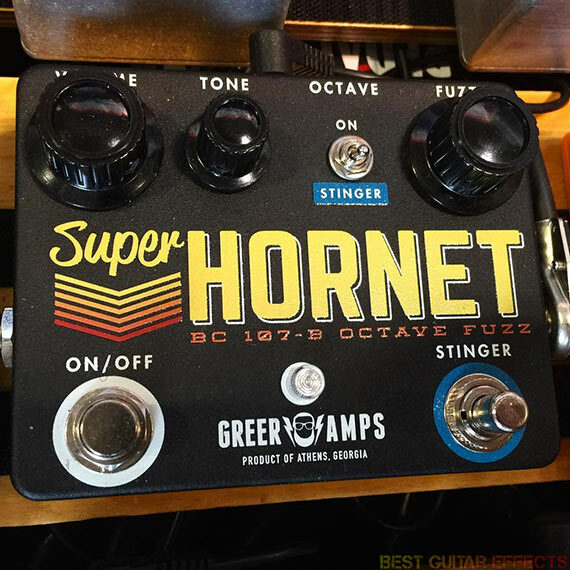 The BC 107-B silicon transistor based Super Hornet has a nice crunchy rhythm sound with plenty of bite and saturation at higher fuzz levels. It cleans up nicely with the guitar’s volume knob as well. Flip the Stinger switch to “On”, and you’ll get a ripping octave up fuzz sound that’s killer for leads or super splatty rhythm sounds that tear your chords apart. But what makes the Super Hornet really stand out is the Stinger mode. Just leave the Octave flip-switch set to “Stinger”, and you can press the momentary Stinger foot-switch to activate the all-analog octave up sound on a whim. Apply it to single note runs and induce analog “Whammy” like sounds. Press it while a note is already ringing out, and it sounds as if you’re hitting tapped harmonics. Can’t give you my final verdict considering the loud NAMM show environment, but it blew me away in the moments I got to spend with it. If you dig lo-fi delays, runaway oscillation, spacious soundscapes, and joysticks, the Hungry Robot Pedals Kármán Line is a pedal to check out. The left foot-switch activates the pedal, bringing in the pedal’s dark and somewhat overdriven delay echoes. The center “Swell” momentary foot-switch brings in a wave of self-oscillating delays that are actually well controlled, as in they don’t escalate into a speaker shredding, ear ripping mess. Very cool. The right “Launch” latching foot-switch activates a below the mix oscillation. This creates a pad of murky delay ambience underneath your playing. Let it run and use the joystick to control the delay time and modulation rate for out of this world delay excursions. 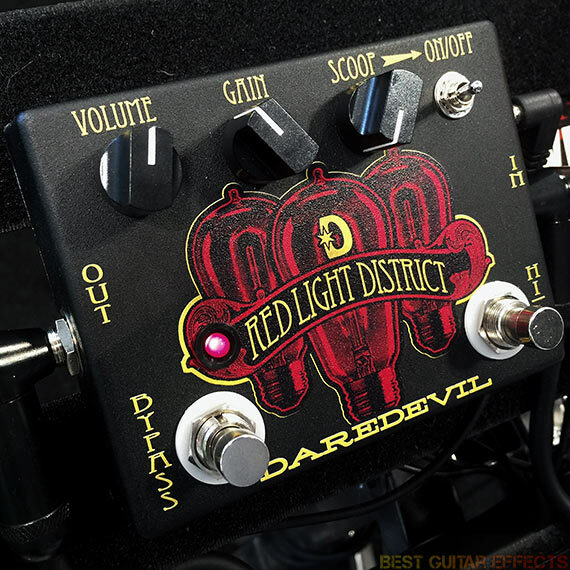 The Daredevil Pedals Red Light District is a straight-up rocking dirtbox that delivers raunchy to searing distortion tones. Aside from the self-explanatory Volume & Gain controls, a flip-switchable Scoop lets you dial in the width of the scoop for a tightly Q’d mid-cut for a wider drop in midrange. A Hi/Lo switch offers a little extra tonal contouring flexibility. Simple and potent, the Red Light District delivers the goods. Speaking of bandwagons and “me, too” products, almost every builder out there is doing a tap tempo tremolo now. But here’s one that offers something a little different. Basically, if you like kill-switches, the Swindler Effects Red Mountain tremolo has a potentially awesome surprise for you. Set the waveform to “st”, and the Tap foot-switch activates a stutter function. Flip the Phase toggle to set it to either “Tap = On” or “Tap = Off”. Kill-switches typically cut the signal when pushing the momentary button/foot-switch, but having the signal pass through while pressing the foot-switch could facilitate easier rhythmic timing of manual stutter effects. 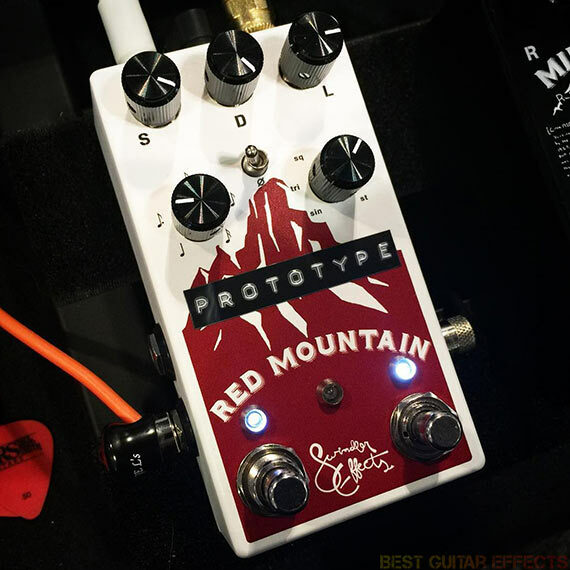 Aside from all the normal trem sounds, stereo outs, and tap tempo, the stutter mode could add some great experimental possibilities and make the Red Mountain something special. A few suggestions/ideas: since the stutter mode uses the optical tremolo manually, negating the function of the knobs, it would be interesting if one of the knobs (Speed or Depth maybe?) could control the speed or duration of the stutter effect’s signal cut. Or maybe one knob could control the attack and the other control the release. Either way, the tighter or faster the stutter, the better as that would make for really tight chops and rhythmic effects. I really dig the Black Arts Toneworks Pharaoh Supreme, a mid-rich “doomy” fuzz pedal. 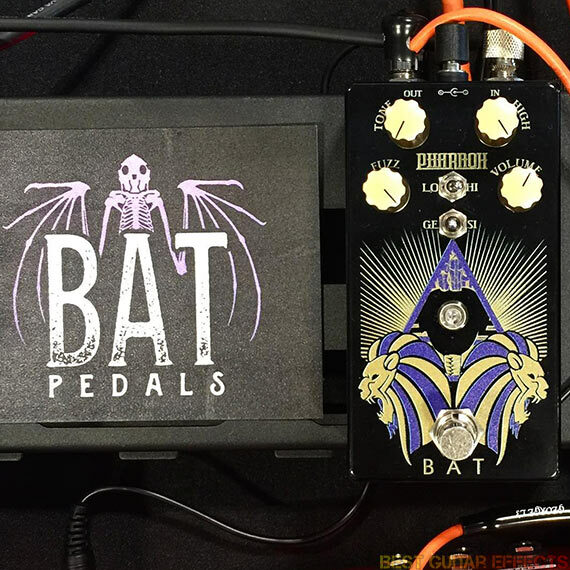 Now the mastermind behind Black Arts Toneworks is co-creating a spin-off brand called Bat Pedals to downsize pedals like the Pharaoh, Black Forest, and more while making them more affordable in the process. Pedals that are pedalboard and wallet friendly sound like a win-win to me. The BAT Pedals Pharaoh is definitely one to watch out for if you like big nasty fuzz, and the BAT Pedals lineup as a whole will resonate with fans of Black Arts Toneworks. Okay, I wasn’t originally excited about this pedal at glance. Chorus & flange is nothing new. But the Digitech Nautila delivers in a big way. You can get plenty of slow moving, light chorus and flange tones. The sound is impeccable from what I’ve heard so far. The Voices control is what really makes things interesting, taking your signal form a single voice to up to 4 flanger voices or 8 chorus voices. Yes, it sounds huge. And you can run it in stereo. The Nautila is simply a monster… a deep sea monster. Should’ve called it the “Kraken” or “Leviathan”, something more ginormous and foreboding. Digitech’s compact stomps (like the excellent Obscura Altered Delay as well) are really pushing boundaries in terms of what to expect from seemingly traditional compact effects pedals. 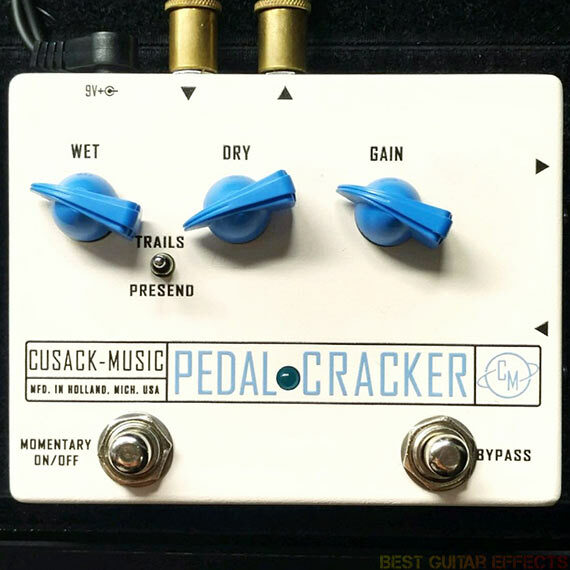 Okay, aside from the fact that this pedal has one of the worst pedal names in recent memory, the Cusack Music Pedal Cracker looks awesome… particularly if you’re a vocalist. The Pedal Cracker’s XLR Input & Output jacks on the right side of the pedal let you feed your microphone signal through the pedal. Then you can add a chain of your favorite guitar effects pedals via the ¼” Send & Return effects loop jacks. You can blend your Wet & Dry levels as well as control the Gain via dedicated knobs. There’s a Bypass foot-switch for activating the effects in your signal chain as well as a Momentary foot-switch for applying effects to only a certain segment of your singing. This becomes more interesting when using the Trails/Presend flip-switch. Imagine sending a single word or phrase into a delay or reverb (or both!) and having the echoes spill over while you sing dry. The possibilities for live vocal performance are staggering. ZVex unveiled a similar device called the Pedal Thief back at Winter NAMM 2015, but it still hasn’t seen the light of day. Kudos to Jon Cusack & Cusack Music for finally getting ready to drop an incredibly useful pedal for vocalists who want to integrate guitar pedals into their live performances. I only wish it had MIDI control or at least a TRS control jack for external control over the Bypass/Momentary functions. 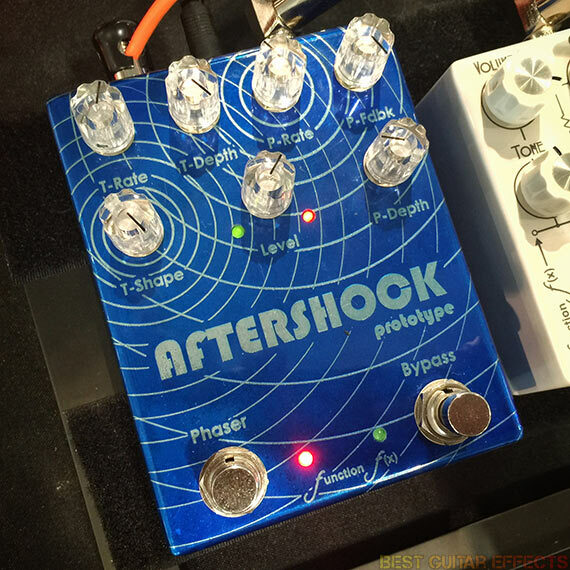 The Function F(x) Aftershock is a dual-modulation pedal featuring a tremolo and phaser section. In addition to Rate & Depth controls for both effects, the tremolo gives you control over the Shape (waveshape) and the phaser lets you adjust Feedback. This pedal had some potentially interesting utility in its present form, but I’m curious if it can be expanded for even deeper control (i.e. more stage options for the phaser, maybe making the effects sync-able). It’s only a prototype but still a sign of potentially exciting things to come from Function F(x). Some consider the signature Boss pedal enclosure iconic. I call it archaic. Some modern guitarists hate the buffers built into every compact pedal. That’s not really an issue to me. However, the switching that always defaults to “bypassed” upon powering up ensures I’ll never use a compact Boss pedal in my effects switcher based guitar rig. Yes, I might be hard on the company sometimes, but in many ways it feels as if Boss has fallen a bit out of touch with the needs of modern guitarists. Boss was once the undisputed “boss” when it came to pedals. Not anymore. But the Boss CE-2w Chorus is something worth celebrating. It recreates the sounds of the legendary CE-1 Chorus, the very first Boss pedal released back in 1976, and the CE-2 Chorus, the first Boss chorus pedal available in a compact stompbox enclosure. The CE-2w offers the classic CE-2 sounds with stereo output possibilities and an expanded CE-1 mode with added Depth control which was unavailable on the vintage CE-1 effects unit. 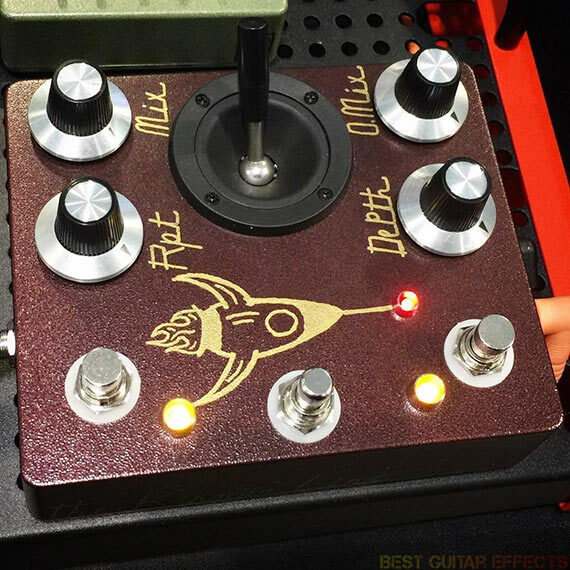 This pedal made the best pedals of SNAMM ’16 list for one reason. Yes, the CE-1 sounds great and is simple to use, but those reasons aren’t why it’s here. I’m a firm believer that the best is always yet to come, and the CE-2w is an example of this philosophy. While this pedal draws upon sounds that are 30 years old, it will essentially render the CE-1 & CE-2 obsolete in the eyes of many guitarists. Sure, the nostalgia hungry guitar player will still chase down the original units, perhaps even swearing that some minor variance in audio fidelity makes the originals superior or gives them more character and charm. 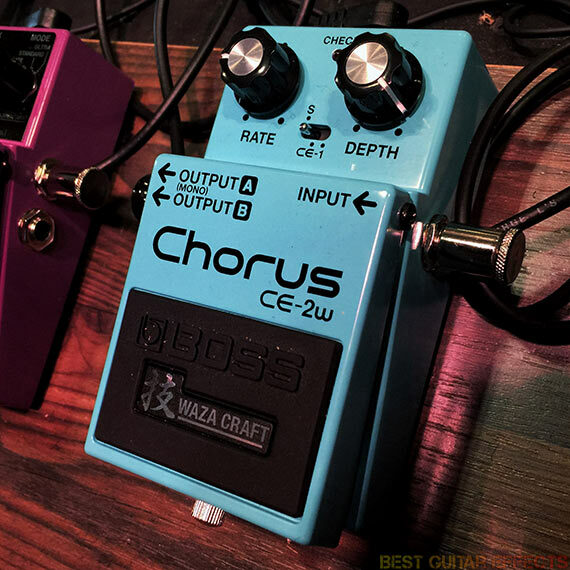 For the rest of us modern guitarists seeking those original tones, the Boss CE-2w Chorus will be a more reliable, versatile, and readily available replacement that remains true to its roots. While I still feel that Boss is resting on a reputation long since overshadowed by the innovations of many great modern guitar pedal builders, there’s an endearing appeal of Boss pedals for those who grew up playing them. Like many of you, my first pedal was also a Boss. Yet while there are still a few classic Boss pedals I’d like to see get the Wazacraft reissue treatment, I’d prefer to see more of that risk-taking spirit I remember from the Boss of old. The overwhelming success of the Strymon TimeLine seemed to shake Boss into ditching those big clunky foot-swiches in their similarly spec’d DD-500 Digital Delay. And I do appreciate a few of Boss’ design updates to their Free The Tone inspired ES-5/ES-8 effects switchers (although I couldn’t possibly recommend using any lazy relay bypass Boss pedals with them). But it’ll take more than mimicking other companies’ innovations to return Boss to their former glory; charting new territory is what once made Boss great. While I appreciate the history and lineage of this legendary company, I hope to see Boss step up their game, surprise us with something we haven’t seen before, and once again become a leader in innovation. Mini-fying pedals isn’t always the most exciting of changes, but it can provide some extra convenience for a crowded pedalboard. 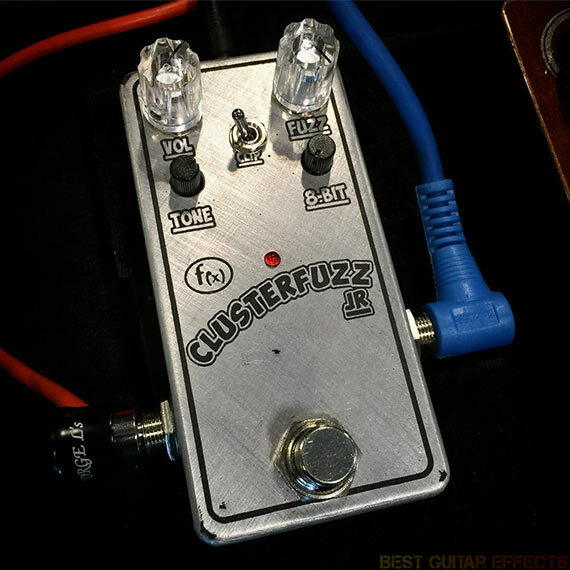 The Function F(x) Clusterfuzz Jr shrinks the original Clusterfuzz to a box that appears like a cross between an MXR-sized stomp and your somewhat more slender mini pedal. All the original rotary knob parameters are here, including the Nintendo tone inducing 8-Bit knob. The 5-way clipping selector knob will be reduced to a 2 or 3-way clipping toggle. I’m personally hoping they keep the original unit’s silicon clipping option although there could be a possibility of releasing 2 Jr versions with each having “no clipping” and 2 of the original’s 4 clipping options. I’m also curious if they can sneak the original pedal’s Filter switch back in as I enjoyed the additional tonal variation it offers. This pedal is a very early prototype, so we’ll see where Function F(x) takes it when it’s finally officially released. Hot off the heels of Eventide’s awesome CrushStation distortion, fuzz, and octave algorithm comes Sculpt, a massively flexible distortion multi-effect for their H9 Harmonizer, H9 Core, & H9 Max stompbox units. The Sculpt algorithm starts with a unique crossover distortion effect that lets you manually set the high/low crossover point and individually adjust High & Low Drive. You also get a Compressor and Low Boost, both of which can be applied pre or post distortion. There’s also Pre & Post Filter sections and a dedicated Envelope Filter control for dynamically controlled auto-wah style filtering. 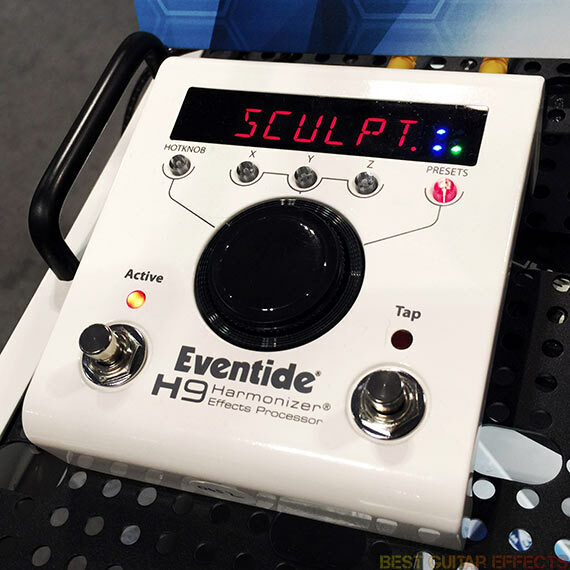 The Eventide H9 Harmonizer isn’t new, but it’s the one guitar pedal that just keeps on giving (yes, I’ve said that before). You’ve probably already seen the Eventide in our list of the Best Modern Guitar Pedals, and it’s new effects like the Sculpt algorithm that keep this pedal on top. This particular algorithm won’t suit everyone’s tastes, but it’s futuristic vibe certainly keeps with the forward thinking mentality that keeps Eventide at the forefront of innovation in guitar effects. As I’ve mentioned elsewhere I’d like to see even more effects that defy expectations and push the boundaries of guitar effects. I’ll cross my fingers for VST plugin style synths and more mind-bending effects. Eventide has the definitive platform with the H9 for making the most insane DSP effects a reality. 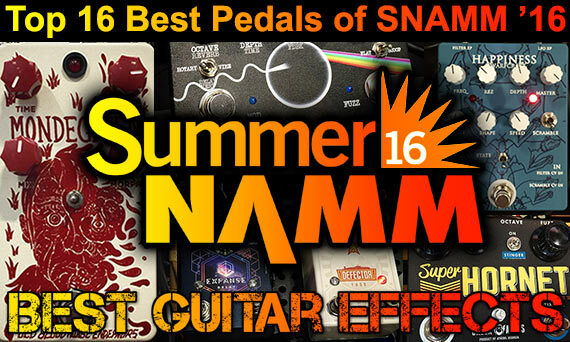 That concludes our list of the “Top 16 Best Guitar Effects Pedals of Summer NAMM 2016”. Thanks for reading! 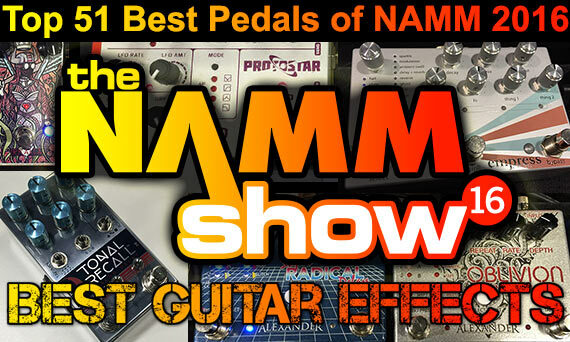 In case you missed it, here’s our Top 51 Best Pedals of Winter NAMM 2016! OK, I’ve moaned before about pedals with flip switches that should be stomp switches, but that joystick on the Hungry Robot has got me right *there*. I have to know, is it sturdy enough to be foot operated, and if not, why not? These BGE NAMM lists always make me Mondegreen with envy. Just one would bring me Happiness and pure (Chase) Bliss. I quite not agree with your Boss bashing. The more I try “modern” pedals and effects the more I appreciate the simplicity of Boss pedals. They just work, and some models sound better than any boutique “innovation” I have tried. Moreover, I had issues with pedals from some of the “best” brands in this article: noise, malfunctioning switches, or just awful sounding pedals (I’m looking at you BAT mons veneris). But 30-40 years old Boss pedals are still reliabe and sound great for a fraction of the boutique price. I’m with you. I’m still searching for the perfect compressor pedal, but so far no one’s come close to the Boss CS-2 (Even Boss with the CS-3. What idiot listened to that pedal and thought “Hmm, needs tone”?). Wow, so many amazing pedals coming out. Thanks for the update! Would love to be able to hear some demos of these pedals. Hi! Just looked bestguitareffects dot com for this article! Thank you guys! The Dark Side pedal picture is so cool! And the Eventide new Sculpt Algorithm is interesting. A lot of new pedal builders on SNAMM frighten me a bit.